NoFo: There's no reason for this. There's no reason for YOU. 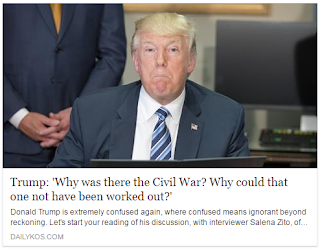 "Andrew Jackson ... was really angry that he saw what was happening with regard to the Civil War, he said 'There’s no reason for this. '”Andrew Jackson's presidency ended 24 years before the Civil War. ANDREW JACKSON DIED 16 YEARS BEFORE THE CIVIL WAR. "Why was there the Civil War? Why could that one not have been worked out? "I refuse to answer this for you. Do your damn homework. Read a book. Finish high school. I hate you. I hate you for your stupidity. I hate you for your lazy, willful ignorance. I hate you for your delusional, self-serving narcissism. I hate you for your desperate need for affirmation above the interests and very safety of everyone else. I hate you for thinking and acting and pretending like you know what's going on as you drive my beloved country off a cliff and into an abyss of your own making, an abyss as bottomless as your intelligence and integrity and dignity and lack of capacity for shame. I go out of my way not to let myself be eaten up by hatred for other people, but with every fiber of my being I hate you. I have clematis! Behind me, I mean. Dare to have dreams. And strive to achieve them. And by "meaningful" you mean "meaningless"
You know what I like to do? Hate you. Well hello, Jackie Schneiter of Farm Bureau! Oh, Sweetie. Bless your heart. "Laughing up their sleeves"? Genius! First rehearsal off-book for Victor/Victoria! Why are his trousers vermilion?